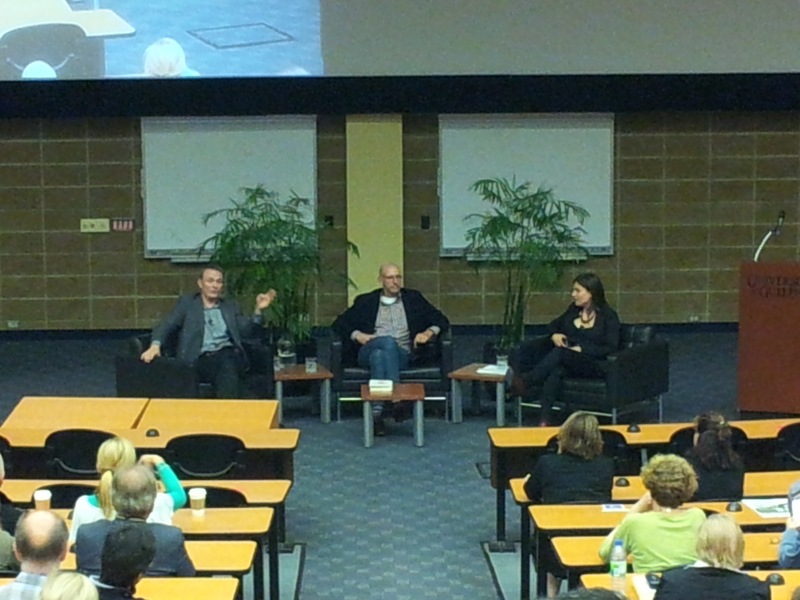 On Saturday I attended a talk called Food for Thought. 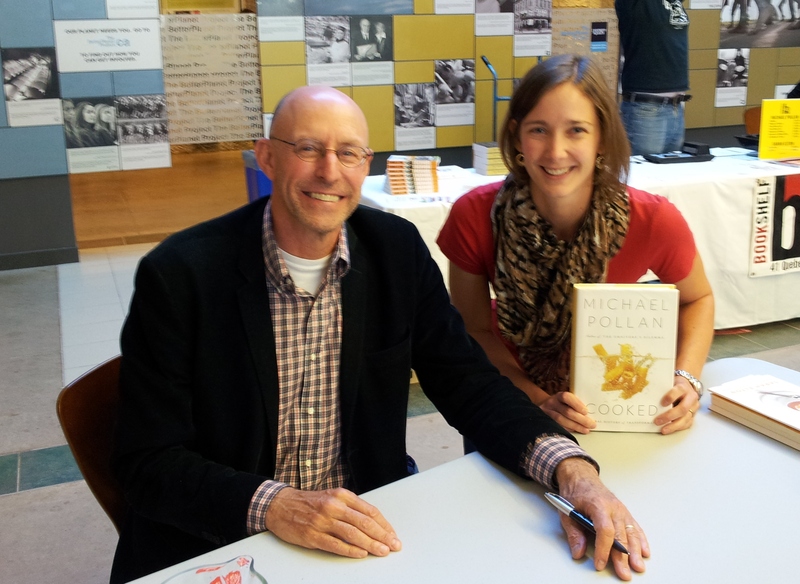 The two panelists were Michael Pollan (super-famous author, journalist and professor who writes best-selling food nonfiction) and Sarah Elton (Canadian food writer and author of The Locavore, who also has a column on CBC radio). Not only was I giddy to see two influential thinkers and writers of food in person, but I was also excited to hear their up-to-the-minute thoughts about where our food systems sit. Despite speaking to nearly 600 fellow writers, scholars, economists, and regular folks (and despite fidgeting constantly in his armchair) Michael Pollan is a charismatic speaker. 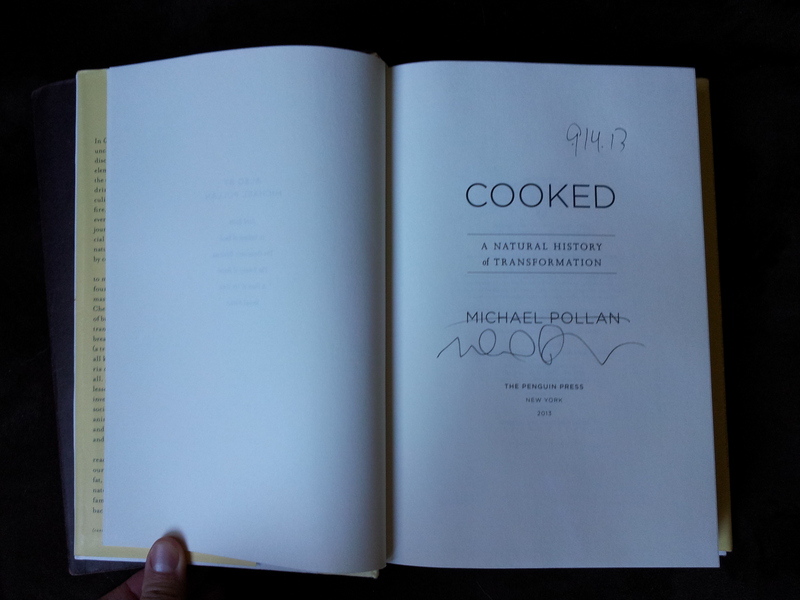 He took us on his journey to discover the food chain, from growing to processing, and how he’s filling in the missing step – cooking – in his new book (aptly named Cooked, the signed copy of which I’m reading now). Interestingly, the talk was moderated by a geographer who focuses on food security (it was supposed to relate to the need to feed an increasingly populated planet in the face of climate change and increased energy costs) yet swung to the intangible side of the spectrum: food culture. This is where my very scientific spouse started rolling his eyes next to me and doodling on his paper. Yes, it’s “soft” but it’s important, because to get people eating real food we have to change the culture. As Sarah Elton put it, “leading by example is not enough.” I loved where the conversation turned next. It turned to cheap food. The idea of cheap food is an uncomfortable one. People are attached to “getting deals” and the prevailing wisdom is that we must go to great length to get them. I was astounded when I started my current job in 2010; the people – women – I worked with were (and still are) absolutely obsessed with getting a deal. They’ll drive 90 minutes from our town in Ontario, Canada, to go to Buffalo, New York to go shopping. To another country. To get cheap food. The kicker is that most of these women have permanent, full-time positions that pay well and come with benefits. They have pensions. They’re dual income, SUV-driving moms who pay fully for their children’s post-secondary education. But paying $9 for a wedge of parmesan here is not acceptable to them when it’s $5 across the border. They feel they’re getting ripped off. Canada has stricter rules about food (and in particular, animal food) than the US. In fact, some Canadian restaurants won’t accept cheese from across the border because the quality isn’t good enough. And who hasn’t heard the horror stories about the antibiotics and growth hormones used in American cattle? So when I couldn’t take the (pardon my language) bitching at the break-room table any longer I finally spoke up – “don’t you know you’re not buying the same cheese?” The woman I was speaking to stared at me, mouth open, dumbfounded. The quality here is higher. We have different standards all the way from how cows are bred and grown through giving birth and milking. But the women I work with don’t see it that way. They think in dollar signs…then take the money they’ve saved and buy more shoes and purses (but that’s a rant for another day). Quality had never crossed their minds. But nobody wants to pick up those costs. I am lucky enough to be able to afford more expensive food. Not gourmet fare, not Brie every day, but perhaps a loaf of whole-grain bread for $5.50 when the packaged white stuff is $1.99. My friends, acquaintances, and family members are mostly well-off enough to pay these prices, but they choose not to. We spend so little on food – about 14% now, compared to over 25% in 1961 – that we’re spoiled by having more left over. And of course, there are always those who don’t have a choice but to buy whatever’s cheapest and most filling. The price of real food versus the processed stuff is an idea that needs to be explored further. There are also things you can do to cut costs in other areas, to re-allocate that food budget. For example, cook. According to Michael Pollan, “poor women who cook have better diets than rich women who don’t”. There are ways around losing our shirts for our food, and it starts with culture.